As I’ve mentioned, time for knitting has been desperately brief this week and last. I stalled out on my lizard ridge because I needed to get Mr. Ink’s second sock done. Oddly, it took me a bunch of tries to get the toe of that one done, I blame a case of inability to brain. I started knitting it, and then I’d rip it back out repeatedly. Once I got moving though, it didn’t go so badly. I moved along on it while waiting on a dentist appointment, and at work during lunch hours, and a lovely visit with a good friend I rarely have the opportunity to see. And then this morning? I got surprise knitting time. I’d forgotten that I had a training session at work. I had to manage to get all the way across campus in a short amount of time, so I grabbed my handbag and took off. Once at the meeting, I realized I had my sock in my bag. 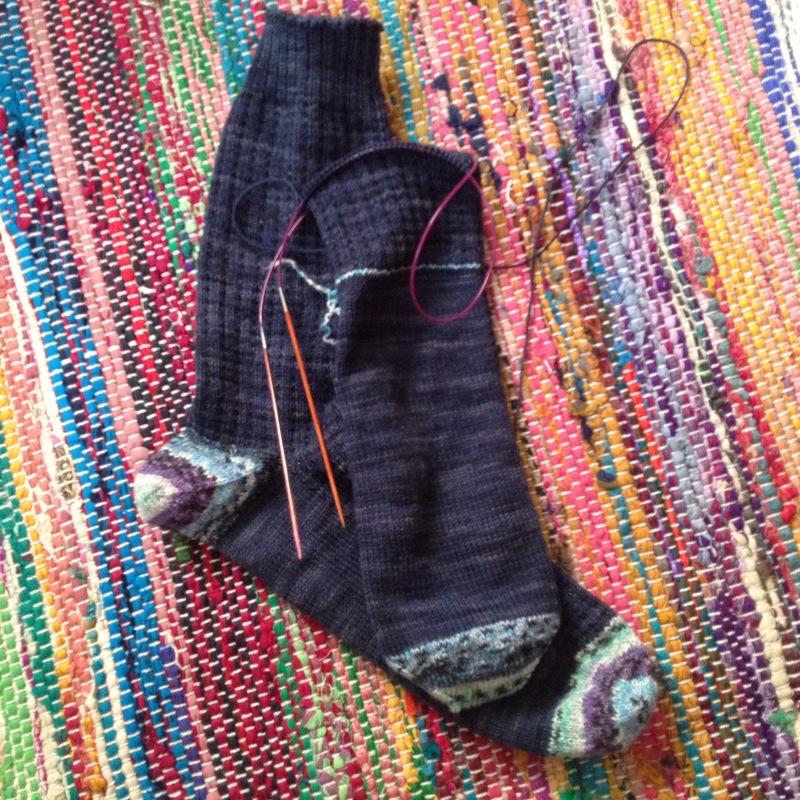 The training lasted forever, and I managed to get past the heel placement on the second sock. It was a total and wonderful surprise! The repeats on these are 3 row repeats, and I now have 22 repeats left before starting the ribbing. It’s rather unfortunate that my index finger is completely angry over the amount of sock knitting I’ve been doing. It’s time for a thimble! That happens to me too! I usually just switch projects because I always have too many WIP’s. I am so glad I am not the only one. I really did draw blood in the finish of these socks this time. Happy to be moving to bigger needles and a looser gauge now.